Q: Recently, the Australian Foreign Minister, when giving an interview to the media, said that Australia is committed to open economy and trade liberalization and that it is concerned about the unilateral measures taken by the United States such as tariff increase targeted at some of its trade partners. What is your comment? A: The statement made by the Australian side reflects the view generally held by the international community. The unilateral and protectionist policies adopted by the United States undermine not only China's interests but also the multilateral trading regime and the interests of other countries around the globe. China stands ready to work with other members of the international community to jointly fight unilateralism and protectionism, uphold the multilateral trading regime and build an open world economy. Q: Can you tell us about China's further reaction to the US, French and British missile strikes against Syria on Saturday? First, the UN Charter has made explicit stipulations on the circumstances for the use of force. The military strikes on Syria by the US, the UK and France violate the basic principle of prohibition of use of force in international law and run contrary to the UN Charter. The modern international law prohibits retaliatory force measures against illegal behaviors. The use of force against Syria on the ground of "punishing or retaliating against the use of chemical weapons" does not conform to international law, neither does the use of force on the ground of unilateral "humanitarian interference" bypassing the Security Council. We have noted that there are also doubts and criticism in the US, the UK and France concerning the legality and legitimacy of such military strikes. Second, when it comes to the use of force against other countries on the ground of chemical weapons, we shall not forget the precedent of the Iraqi issue. That historical lesson should be learned, and such tragedy shall never be allowed to happen again. We noted that senior officials of those three countries you mentioned said that it is "highly likely" that the Syrian government had used chemical weapons, or in other words, they are still "looking for the evidence". We believe that it is very irresponsible to launch military strikes on a sovereign country on the ground of "presumption of guilt". The issue of Syrian chemical weapons calls for truth. Third, China's position on the issue of chemical weapons cannot be more clear-cut. We oppose the use of chemical weapons under whatever circumstances and for whatever purposes by any country, organization or individual. 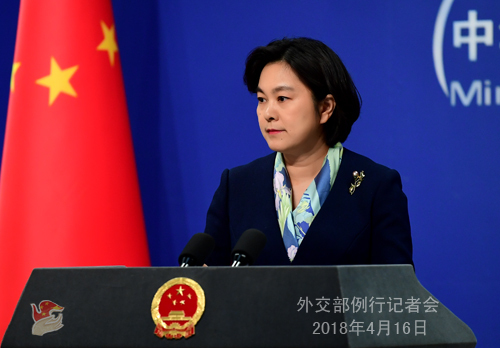 China maintains that a comprehensive, objective and impartial investigation shall be carried out to reach a fact-based conclusion that can stand the test of time. We support the OPCW in sending a fact finding mission on the ground. Yet before a conclusion is reached, no prejudgment should be made. In the end, I would like to stress again that military means will lead the Syrian issue to nowhere and political settlement is the only viable way out. The wanton use of force will only escalate instability in the region and complicate the issue. The relevant parties should earnestly draw lessons from the past and avoid repeating the tragedy. Q: According to Reuters, on April 12, US Secretary of Commerce Wilbur Ross vowed at the Americas Business Summit that Washington would not cede leadership in Latin America to the countries that exploit the region's rich natural resources and that Latin American economies benefited more from trade with the US. He said that as opposed to the raw materials and agricultural commodities that make up the bulk of Chinese imports, most US imports from Latin America are high value-added products, which are more beneficial to the local economies. What is your comment? A: Only the wearer knows whether the shoes fit or not. Likewise, people from Latin American countries are in the best position to say whether China is a good cooperative partner for them or not. China's economic cooperation and trade with the Latin American countries is equal-footed, sincere and mutually beneficial. Our cooperation follows the principle of equality, mutual benefit and win-win results and does not target any third party. China never capitalizes on geopolitics, seeks an exclusive club, forces others to buy or sell condescendingly or frequently threatens other countries with a trade war. The facts have proven that our cooperation meets the common interests and expectations of the two sides and focuses on common development and the outcomes are mutually beneficial. Now China is the second largest trading partner for Latin America and Chinese enterprises have created a total of over 1.8 million jobs there. Regarding such cooperation, people from the Latin American countries have made their voice loud and clear enough and we hope that the US can listen to them with an open mind. Just as President Xi Jinping pointed out at the Boao Forum for Asia Annual Conference 2018, China will stay committed to the strategy of opening up for win-win results, promote high-standard facilitation of trade and investment, further ease market access and proactively expand imports. This will provide more business opportunities and broader market for other countries around the world, including those in Latin America. We are willing to work with the Latin American countries to expand our mutually beneficial cooperation. 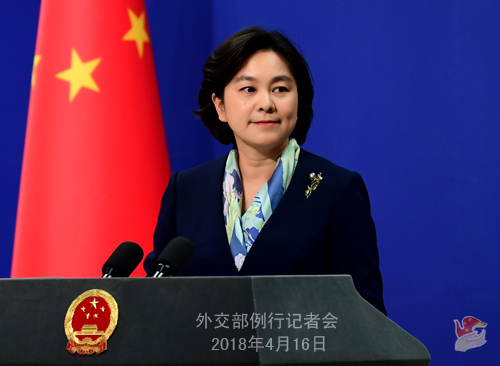 We hope that certain people from the United States can respect the fact and the will of the Latin American countries, view China's cooperation with the Latin American countries in an objective way and contribute more to the development of Latin American countries instead of indiscriminately pinning labels on others, still less politicizing the economic and trade issues. Q: Recently, there have been frequent exchanges between the Chinese and Indian governments. Does that suggest a warming-up in China-India relationship? How does China view the prospect of its relationship with India? A: Since this year, under the guidance of the leaders of the two countries, China-India relations have maintained a positive momentum of development with close interactions at various levels and new progress of cooperation in various fields. Yang Jiechi, member of the Political Bureau and Director of the Office of the Foreign Affairs Commission of the CPC Central Committee, recently held talks with Indian National Security Advisor Ajit Doval in Shanghai. The 11th meeting of the China-India Joint Economic Group and the 5th China-India Strategic Economic Dialogue have been successfully held and the officials of the Foreign Ministries of the two sides also exchanged visits. Besides, the two sides held working mechanism meetings on border affairs and cross-border rivers. The above-mentioned interactions have fully indicated that China and India share extensive common interests and enjoy promising prospects for bilateral cooperation. China attaches great importance to its relations with India. We are ready to work with India to follow through on the important consensus reached by the leaders of the two countries and stick to the right direction of our bilateral relations. We will further accumulate positive energy and expand new areas for cooperation so as to move forward the sound and steady development of bilateral relations. Q: You mentioned that the military strikes by the US, the UK and France were a violation of international law. I wonder if China is condemning these attacks? A: With regard to the military strikes on Syria by the US, the UK and France, we have immediately stated China's opposition to the use of force in international relations and call for respect for other countries' sovereignty, independence and territorial integrity. We have also made it clear that any unilateral military action bypassing the Security Council is in violation of the purposes and principles of the UN Charter and the principles and basic norms of international law. Q: According to reports, State Councilor and Foreign Minister Wang Yi is on a visit to Japan and another round of China-Japan High-level Economic Dialogue was held after a lapse of eight years. What is your comment on the recent improvement of China-Japan relations? A: The China-Japan relations are witnessing the momentum of improvement. State Councilor and Foreign Minister Wang Yi's visit to Japan upon invitation is a response to the positive policies towards China adopted by Japan over a period of time. We hope that this visit can serve as an important step for our bilateral relations to come back to the normal track and create conditions and make preparations for the high-level exchanges going forward. We hope that the two sides can maintain communication and make concerted efforts to create conditions for the high-level exchanges going forward and the steady improvement and development of China-Japan relations. This year marks the 40th anniversary of the China-Japan Treaty of Peace and Friendship. The two sides should follow the principles of the four political documents, put history in perspective, abide by the one-China principle and translate into concrete actions the consensus of treating each other as cooperative partners and not posing threat to each other so as to ensure the sound and steady development of bilateral relations along the right track. 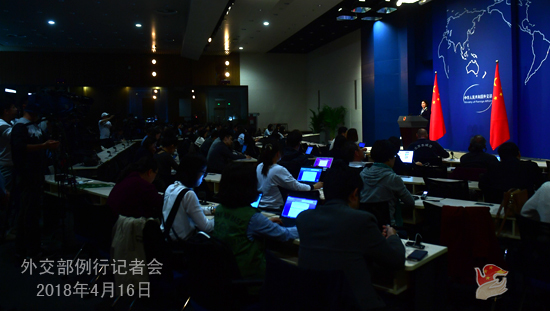 Q: Reports say that there are accusations against the financing projects in the framework of China's Belt and Road Initiative. It is also said that the Hambantota port in Sri Lanka may be used as a military base in the future. What is your response? A: With regard to the Belt and Road Initiative and its progress, we have talked about them on multiple occasions. As to the different views held by some people mentioned by you, I think that the conclusion may be different when people view the same thing with a different mindset and from a different perspective. The Belt and Road Initiative is open and transparent and we hope that relevant countries can follow the principle of extensive consultation, joint contribution and shared benefits to advance it and deliver benefits to their people. Regarding the specific project in Sri Lanka mentioned by you, it is a cooperation project conducted by China and Sri Lanka on the basis of equality and mutual benefit. It will contribute to local socio-economic development. Our two sides have the strong will to ensure the smooth progress of this project. I think that there is no need for certain people to make speculations from the military or other strategic perspectives.